Steve Chen, co-founder of YouTube and AVOS Systems, Inc., generously designated a $1,000,000 lead gift, through the Schwab Charitable Fund, to the IMSA Fund for Advancement of Education to benefit his alma mater, the Illinois Mathematics and Science Academy (IMSA). This gift to IMSA was the start of what is now called IN2, The Steve and Jamie Chen Center for Innovation & Inquiry. 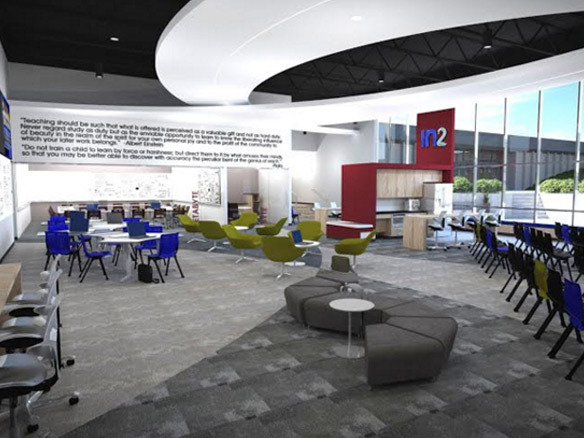 IN2 is a $1.9 million, 6,500 sf innovation, collaboration, prototyping, and business incubator space located inside the existing Aurora, Illinois campus. Cordogan Clark & Associates began designing this space by gathering information from IMSA and visiting local spaces that perform similar activities. Gathering information is the designer listening. "What are the goals?" is the first question we ask. Sounds simple, but channeling the user’s wants into architecture takes understanding, skill, and talent. Secondly, we visited 1871 (www.1871.com) located at the Merchandise Mart in Chicago, and IIT's University Technology Park (www.universitytechnologypark.com), both collaboration spaces. 1871 is a place where start-ups interact with businesses, educational institutions, and governments. If 1871 is part of the highway, IMSA's IN2 will be an on-ramp to the highway. There's a new paradigm in the way young people learn today. Google and Facebook, for example, were companies created by young people while they were still in college. They had no funding or business experience, but they were their own kind of expert in new technologies. 1871 and others use this history to make it easier for students (or anyone) to create, design, and test new ideas and share it with others who may be able to help them start a new business. These places benefit students, and they benefit businesses. Businesses are able to mentor students, plus they get to see new talent and new ideas. There is a new kind of freedom for young people to act upon their ideas NOW before they graduate college and have decades of business experience. IN2 is designed to give students a place to create, act upon, and share ideas. Once we understood the goals and visited similar spaces, the third step was a design charrette. The designers collaborated with IMSA students, teachers, and representatives from businesses, local government, and other academic institutions. Using the on-ramp goal, a collaborative and consensus based concept was selected for implementation into a floor plan.